Can anyone give me the correct pinouts from Gen7Expansion header to LCD/Encoder? Schametic perhaps? Of if that has been done, point me to it as a search here and google didn't deliver anything. I have seen the actual header yes, but this being first try at putting sd/lcd in it, I was hoping for a "what goes where"
I am also planning to use the GEN7 1.4.1 expansion header to connect SD-Card, Display, Rotary Encoder. Any suggestion or issues with these assignments ? So for the SD-Card MISO,MOSI and SCK are required. You need an additional PIN for SS (select). For a LCD you need at least 4 Data, RS, Enable (making 6 outputs). Directly connected 10 of 13 free Pins, so you could get it working directy. 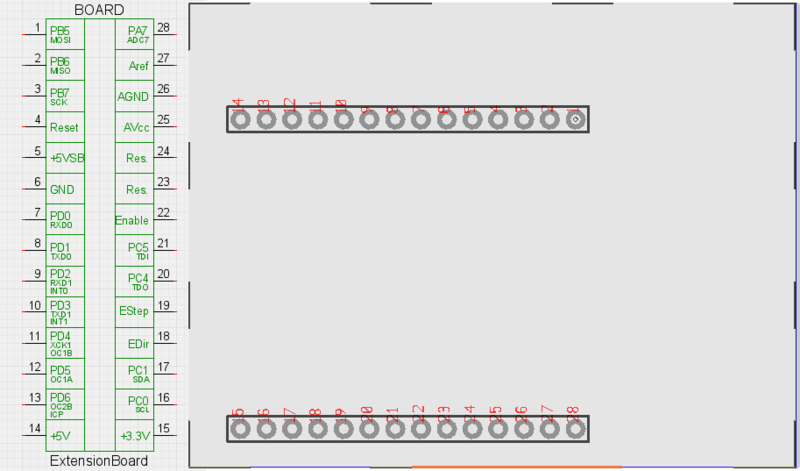 But I2C or a 74HCT595 (shift-register) will give you some additional ports for FAN, 2nd Extruder. I tried to not assign the A7 as this is the only analog port on the expansion header for the temperature measurement of an additional extruder. For the rotary encoder it might be useful to have interrupt pins. I2C only needs SCL and SDA afaik. You can get a cheap PCF8574 connected on SCL,SDA to get extra 8 ports. Edited 1 time(s). Last edit at 10/08/2012 02:21PM by mcp. Me agree? What for? I have no idea how a display is connected to an ATmega. That said, I'm pretty sure Kliment's SD Card adapter works, too. You'd just have to solder a wire for the card select signal. Actually, the reasons why there is no SD Card ExtensionBoard is, I can't find a reasonably priced card holder and many other things related to Gen7, like enhancing gEDA, enhancing Visolate, teaching Teacup a proper look-ahead, building a RepRap machine really suitable for PCB milling ( <-- most important right now) and all this pains me in my ... back more. Thanks sir... I did notice Alfons3 mentioned he stopped development because the resistors werent working reliably... Will agree though that we use the same pins, but I'll do one with a CD4050 to do level shifting instead... Will report how it goes. That pinout is much appreciated. MCP, when do you plan on starting to do the LCD? I will start Display, SD_Card and Keys as soon as I get my printer printing. I use repetier as it contains already SD_Card, Display and Keys. For the SD_Card I will use an arduino SD_Card adapter from ebay (Also resistore based) to start with. Shouldn't be too difficult to put this in. I'd liko to go for 2 PCB, one on the extension ports and one for the Display, SD-Card and Encoder. Both connected by a 10 pin Wire. See the attached schematic for the adapter. I will try to do the Display Key later. 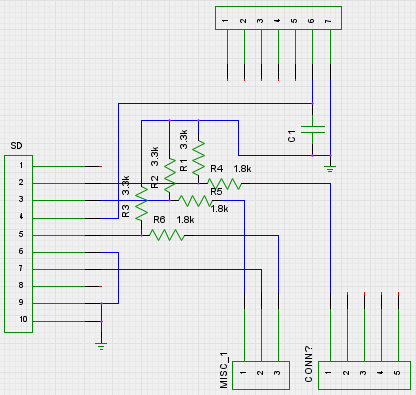 For the display and encoder the schematic would look something like this. Edited 1 time(s). Last edit at 10/09/2012 03:56PM by mcp. I can confirm that Afons3 resistor based variant isn't working properly. I'm using a 74HC4050 for voltage dropping. As Traumflug said it's hard to find an inexpensive sd card holder. So I'm using a simple Micro SD Adapter for 1€. At the moment im running Marlin on my Gen7 1.4 together with an SD Card/LCD/Rotary Encoder. > That pinout is much appreciated. > MCP, when do you plan on starting to do the LCD? This way it'll never get it, because you're the only one who could test such stuff. No problem, though. I can confirm that Afons3 resistor based variant isn't working properly. Sorry Traumflug... my electronic knowledge is only self educated . I've also come around some FAQs and Posts in arduino forums which mention this methode. So I've broadboarded one of those some months ago. About 1 of 20 tries the sdcard got read correctly but that didn't satisfy me. a resistor based level devider doesn't "switch" fast enough. Quite possible and depends on the resistor values choosen (again, that's what I've read in some FAQ). Imagine each of the pins is connected with a capacitor. So, to get this cap to a given voltage, this cap has to be filled, requiring a current to flow for some time. The lower the current, the longer it takes to fill this cap and the longer it takes to make the pin recognize the signal. All that happens in the nanoseconds range. A solution would be to either reduce the communications speed with the SD card or to make these resistors smaller, e.g. half the value for each of them. Smaller resistors give more current to the pin, but also waste more current out of the sending pin (which isn't always neglibile). Didn't want to disturb your work, just share a bit of what I've found out. Thanks for the explanation Traumflug! Sounds reasonable!! I remember I've played around with lowering the SPI speed then. But the results were still about the same. Cause the 74HC4050 costs just about €0,35 and works also on full spi speed I've stopped my researches on this. 2. Test i2c encoder - if that doesnt work wire encoder directly. Hi Peter, that looks very promising, almost the same thing I thought about yesterday, but you soldered a bit faster. How did you assign the LCD pins to the PCF8574 and why do you think that the encoder wouldn´t work over I2C? I wired the above as per MCP's schematic. The only Arduino i2c library I could find, uses a different order for the pins from PCF8574 to the LCD. Can you help me with a sketch/library to test this with? and did you verify your schematic against how Repetier should be? > Both connected by a 10 pin Wire. > try to do the Display Key later. > look something like this. > why do you think that the encoder wouldn´t work over I2C? "If you have the pins, use direct connection. It is much faster and less error prone. A rotary encoder over I2C works only with slow turns!" It's under the "User interface configuration" section just past halway through the page. Edited 3 time(s). Last edit at 10/12/2012 09:31AM by peter6960. I did not yet build mine, (still need to get my printer printing first), but repetier can be configured for any PIN combination on the PCF8574 as far as I understood. Ahhhh! I luckily don't have a bed on mine, but you can't believe how thats been driving me up the wall. I'll make a seperate thread in the firmware thread later - but here's the issues I have with Repetier - perhaps you had some too? 3. Missed steps - only in X axis - when back on teacup not an issue. Have bought a new pololu too before going back to teacup and finding old driver to be fine. So next step, the encoder. I have never used a rotary encoder before and spent the last few minutes looking for a PCF8574 schematic with a photo to check pins. Any help? 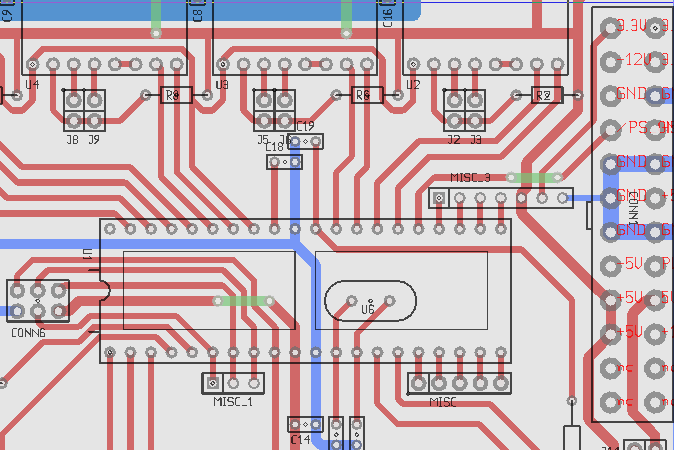 MCP, I don't understand you're schematic... Why the second PCF8547, just for one button? Though I do like that you have the rotary encoder directly wired (faster). Or do you plan to add a Back button and any other buttons or LEDs? Repetier himself helped me sort out the issue: I2C address was wrong, should be 0x70 in his libraries. Edited 2 time(s). Last edit at 10/13/2012 05:54AM by peter6960.